Gmail improved substantially the interface for uploading attachments: now you can select multiple attachments at once and there's a progress bar that displays the status of your uploads. It's much easier to upload multiple files from a folder, although you still need to use a third-party extension to attach files using drag-and-drop (the extension is not compatible with Gmail's new Flash uploader, so you need to disable it from Gmail's settings page). If you don't like the new Flash uploader, it can be disabled from the Settings page by selecting "Basic attachment features - Attach one file at a time and don't show progress bars". Is it a Lab feature? Is it released only to some accounts? No, it's not a lab feature. I think the only requirement is to use the new version of Gmail, so it works in IE7, Firefox 3, Safari 3+, Chrome and Opera 9.5+, but not in IE6. I got it just by logging out and logging back in again. It also requires flash, though it appeared that it would fall back to the old flash-less interface if you wanted. yes but the drag-n-drop extension can't work with this...? It's not working in the UK. Maybe it'll take a bit longer. I just logged off and in. Logged off and back in again works for me. You're right, but the extension still works in the old version of Gmail. The "bug" of the trashed uploads looks more like a feature to me. I think it's a terrible bug. 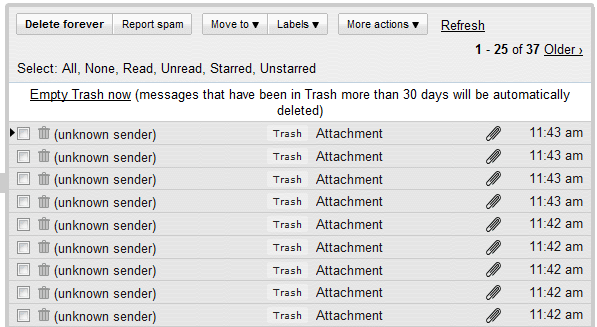 Every time you upload a file, Gmail creates a pointless message and sends it to "Trash". Hey that's a great update you guys! Will notify my blog network to spread this news around a bit. Nice work, the flash is completely invisible but used under water. Great feature. Flickr's had this sort of flash uploader fo-evah. Multi-file uploads are something the Web has needed for a long time, and I am a little sad that Flash is the answer right now, but glad that it's getting implemented. Someday browsers will implement this, I hope. is it working for the last nigtly of shireteko on mac? For myself, I can't send an attachment any more, the pop-up opened, I clik on the file, the pop-up closed and nothing append. So it's a bug? When I got the RSS post about this new feature, I went to Gmail and tried the new upload feature -- it worked but when I discarded the test and went to Trash, I saw there were 3 discarded messages with the files (3) I had attached to the test message. I hope this is a bug and not "by design." This is a great feature!!! Cant gmail enable drag-and-drop using flash? Guess that explains why Firefox & Flashblock are suddenly putting a "Hey, there's a flash thing here" in the middle of my email page. TBD whether I like it or not yet. I don't know that I've attached more than one file at a time to gmail, so being able to attach a bunch doesn't give me a lot. If you don't have Flash, Gmail will use the old way to upload files. There's also an option to disable the Flash uploader: you'll find it in Gmail's settings page. @Alex: Why are all your links (Attach file, Add CC, etc.) red? It works like a charme, please also use this interface also for google docs! I customized the Gmail theme. Found it. Hate it. Wish there was a way to ban *all* flash from Google. AJAX is *far superior* than craptastic flash, especially for something like this. This Gmail Flash uploader is not working my Mac. running OSX 10.5.5 on Intel based Mac. Anyone have any ideas if this is fixable on my end? Or is this something Google hasn't worked out yet? This also completely fixed the bugs we've experienced throughout our company for over two years now (Mac OS X 10.4.11 lately, various machines, Safari and Firefox) where you would attach something, click Send, and it would never, ever send, no matter how secure the network connection or how small the attachment. Good job, Google. This reminds me of my top gmail feature wish. Why can't we select multiple mails by click and drag? It is annoying to click on the tiny check boxes 10-15 times. Awesome feature and really like it .The progress bar is not clearly visible in the new blue theme .Anyone else experiencing it ? I don't know whether this is new or not, or related in any way, but the other day I was trying to cut-and-paste a URL into a Gmail message and accidentally got the URL AND and adjoining photo. Previously I didn't know you could cut-and-paste photos or other objects into the middle of a Gmail message (as you can with most e-mail programs) and instead has always been just attaching them. Maybe this capability has been there all along and I just never knew it. I do know that messages with embedded content DISPLAY just find in Gmail, but didn't until recently realize you could create such things too. I wish they'd fix the bug that shows the wrong file size on large attachments. Try uploading a large file (2 MB should do it), save as draft, open the draft and the file size displayed next to the attachment will be way too low. (GMAIL) Does any body know what could be wrong? I'm forced to use Basic attachment features because with Advanced ones I cannot attach any file. Always I get the message "Attachement failed". I have set up Flash player to revision 10,0,22,87 (last revision) but the behaviour is still the same. I'm getting the same problem that Josep M. has. At home with my laptop it simply fail and at work i get a message from the corporate network asking my corporate password but even if I type it right the browser will deadlock and the atachment fails. Had to revert back to old style atachments. I'm running Firefox 3.0.7, IE6.0.2900.5512 SP3 and Flash player 10.0.22.87. I love the new uploader... I'd like to use something like that in one of my webapps... anyone know if there's a source code set for it? This works only under Windows/IE? I am using Firefox on Linux. This feature now doesnt work in Firefox 3.0.8!!! I find you have to wait for a while to use this feature again. You have to use single attachment during this interval and this delay should be longer than one minute, as I estimated. Is it a bug or protection? Nice feature, but it usually fails for me with large files, both in Firefox and Chrome. Several retries tend to be enough to get the attachment through, but clearly something is wrong. I'm not behind a firewall and my Flash plugin is at the latest version. Its working well in IE8 and it used to work well in Firefox 3+. But since I updated to Firefox 3.0.11 and now 3.0.11 the multiple attachment doesn't seem to be working. I get only the basic attachment functionality in Firefox. I have the same problem as Rohit, but I'm using FF 3.5 b4 on OSX - has it been disabled for this os/browser? same to me! the the multiple attachment just disappear! any idea? Same problem for me! Basic attachments works, but not Flash. I also have latest Flash, Firefox 3, and OSX 10.5.8. Google Mail cannot upload attachments in Google Chrome 3 (XP). The irony. Good news is, Google mail cannot upload attachments in IE 6 (XP) either. Neither the basic uploader, nor the new flash based uploader work. My computer has the latest version of flash, anyways. Thanks a lot, gmail. This problem has been going on for ages, maybe nobody noticed it. Heh. It is likely that the files which end up in the trash are an expected byproduct of the workaround solution by Google's programmers to achieve the multi-select capability rather than a bug. Adding this functionality probably meant a major redesign or using the workaround of creating multiple single attachment mails and aggregating them into one email after the attachment has taken place. I can't personally see a problem with the trashed emails; I would prefer Google to spend some time addressing the very irritating and inconvenient noname.txt attachment issue whereby attachments are received in an unintelligible format - a "feature" of the GMail product for the last couple of years I'm afraid! If you guys still having problems uploading attachment, try using firefox. IE has lots of problems, mostly css issues. I like gmail... simple management. I already use it. Very helpful. Isnt working on 10.10 w/ FF4.0 ... cant figure out y?! For everybody who is using Gmail on OS X — Gmail Dock Attach (http://www.gmaildockattach.com/) is the simplest and fastest way to compose new Gmail message by draging your files from Finder to icon of this small app. Is it work in Ubuntu (linux)? I found that many flash uploader not work in Ubuntu.